America’s corporate polluters are not color-blind. Nor are they oblivious to distinctions of class. Studies of environmental inequality have shown that minorities and low-income communities often bear disproportionate pollution burdens (for overviews, see Ringquist 2005 and Mohai et al. 2006). In other words, rather than being an impersonal “externality” randomly distributed across the population, the distribution of pollution mirrors the distribution of power and wealth. These disparities result from decisions by firms to site hazardous facilities in the most vulnerable communities and from decisions by government regulators to put lower priority on environmental enforcement in these communities. To some extent, the disparities may also reflect demographic changes as pollution leads affluent people to move out, neighborhood property values to fall, and poorer households to move in. But even after controlling for income differences, racial and ethnic minorities typically face higher pollution burdens, a finding that implies that disparities are a result of differences in political power as well as purchasing power (Boyce 2007). But the US is a big country, and it is not homogenous. Electoral politics, social movements, industrial structure, residential segregation, and even laws and regulations differ greatly across the regions. The extent and pattern of environmental inequalities may vary, too. In a recent study (Zwickl et al. 2014), we examine regional variations to tackle two key questions. First, is minority status or income more important in explaining environmental disparities? Second, is higher income equally protective for whites and minorities in affecting pollution exposure? In our study we use a US Environmental Protection Agency database called the Risk-Screening Environmental Indicators (RSEI). These data can be traced to the demands of environmental advocates for disclosure of information on the hazards faced by communities in the wake of the tragic 1984 accident at a chemical plant owned by a US company in Bhopal, India, in which thousands of nearby residents died and many more were severely injured. In response to this man-made disaster, the US Congress passed the “Emergency Planning and Community Right-to-Know Act,” which requires companies to report their releases of dangerous chemicals into our air, water and lands. The EPA makes this information available to the public in its annual Toxics Release Inventory. The RSEI database uses this information to estimate industrial pollution exposures in neighborhoods throughout the country. In our study, we merge RSEI air pollution data with census data on race, ethnicity and income in urban areas. 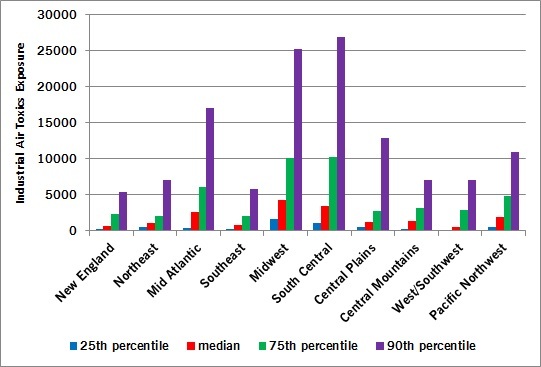 As shown in Figure 1, industrial air pollution exposure varies greatly across regions of the country. The highest median exposures, as well as the highest 75th and 90th percentiles of exposure, are in the Midwest, South Central, and Mid-Atlantic regions. In an econometric analysis that controls for inter-city variations to identify disparities within cities, we find significant differences in exposure by both income and race/ethnicity nationwide and in most EPA regions. 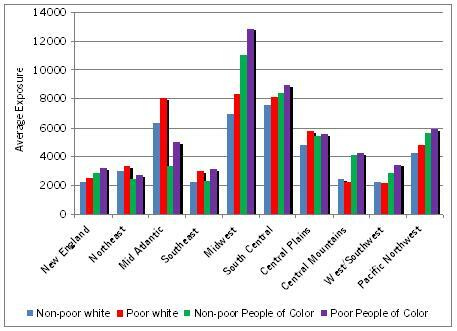 Figure 2 shows average pollution exposure by region for four groups: non-poor whites, poor whites, non-poor minorities and poor minorities. Poor minorities consistently face higher average exposure than non-poor minorities, and that in all but two regions, poor whites face higher average exposure than non-poor whites. In the majority of regions, poor minorities also face higher exposure than poor whites, and in all but two, non-poor minorities face higher exposure than non-poor whites. But we also find differences – for example, the contrast between the Midwest region and the Mid-Atlantic region in average exposures for whites and minorities – that point to important inter-regional variations in mapping environmental injustice. Figure 3 presents national-level data on average exposure for four racial/ethnic groups across eight income strata. The most striking finding here is that racial disparities in pollution exposure are much wider in lower-income neighborhoods. 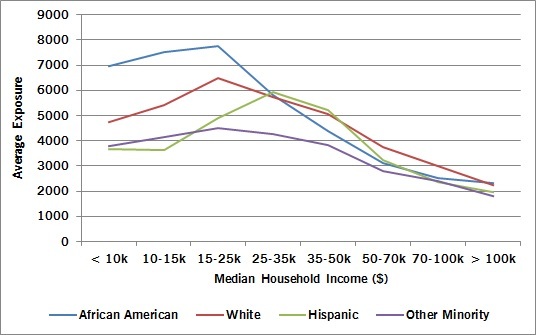 In the poorest stratum, African-Americans have an average exposure 47% higher than that of whites. Hispanics and other minorities in low-income neighborhoods have lower average exposures than whites, but this is due to the fact that this graph combines between-city and within-city differences. Hispanics and other minorities tend to live in cities with below-average pollution, but within these cities they tend to live in the more polluted neighborhoods, whereas African-Americans tend to live both in the more polluted cities and in the more polluted neighborhoods within them (Ash & Fetter 2004). Consistent with previous studies (for example, Morello-Frosch et al. 2002), we find an inverted U-shaped relationship between pollution and income for all four racial and ethnic groups, with a turning point at around $25,000 annual household income. The rising portion of these curves reflects positive associations among industrial activity, incomes and pollution across cities, while the falling portion reflects disparities in facility locations within cities. Above the turning point, pollution declines for all four racial and ethnic groups as neighborhood income rises, and in high-income neighborhoods racial and ethnic disparities in exposure are almost non-existent. However, the share of racial and ethnic minorities in the population also declines with rising income (for data, see Table 1 in Zwickl et al. 2014). We conclude that based on where they live, most whites are likely to see income as the main factor explaining disparities in pollution exposure, while for most African-Americans the racial composition of neighborhoods appears to matter most. The available data enable us to gain important insights into relationships among race and ethnicity, class, and pollution exposure in the United States. At the same time, much remains to be learned. Despite the victories of the environmental right-to-know movement, there are still many blind spots in our information about pollution exposure. For example, fracking wells for oil and natural gas extraction currently are exempt from the reporting requirements of the Emergency Planning and Community Right-to-Know Act. Other important environmental databases, such as the National Air Toxics Assessment, have not been updated for almost a decade. These gaps not only impede analysis of environmental injustices, but also leave communities uncertain about environmental conditions in their neighborhoods. Vigilance and advocacy are crucial to defend and extend the public’s right to know about pollution, and to make the right to a clean and safe environment a reality for all. Ash, M. & Fetter, T.R., 2004. “Who Lives on the Wrong Side of the Environmental Tracks? Evidence from the EPA’s Risk-Screening Environmental Indicators Model.” Social Science Quarterly, 85(2), pp.441–462. Banzhaf, H. & Walsh, R., 2008. “Do people vote with their feet? An empirical test of Tiebout’s mechanism.” American Economic Review, 98(3), pp.843–863. Been, V. & Gupta, F., 1997. “Coming to the nuisance or going to the barrios? A longitudinal analysis of environmental justice claims.” Ecology Law Quarterly, 24(1), pp.1–56. Boyce, J.K., 2007. “Inequality and Environmental Protection.” In J. Baland, P. Bardhan, & S. Bowles, eds. Inequality, cooperation, and environmental sustainability. Princeton, NJ [u.a. ]: Princeton University Press, Princeton, NJ. Boyce, J.K., 2002. The Political Economy of the Environment, Edward Elgar. Mohai, P. & Saha, R., 2006. “Reassessing Racial and Socioeconomic Disparities in Environmental Justice Research.” Demography, 43(2), pp.383–399. Morello-Frosch, R. et al., 2002. “Environmental justice and regional inequality in southern California: implications for future research.” Environmental Health Perspectives, 110(S2), pp.149–154. Pastor, M., Sadd, J. & Hipp, J., 2001. “Which Came First? Toxic Facilities, Minority Move-In, and Environmental Justice.” Journal of Urban Affairs, 23(1), pp.1–21. Ringquist, E.J., 2005. “Assessing Evidence of Environmental Inequities: A Meta-Analysis.” Journal of Policy Analysis and Management, 24(2), pp.421–443. Zwickl, K., Ash, M. & Boyce, J.K., 2014. “Regional Variation in Environmental Inequality: Industrial Air Toxics expsure in U.S. cities.” Ecological Economics, (107), pp.494–509.